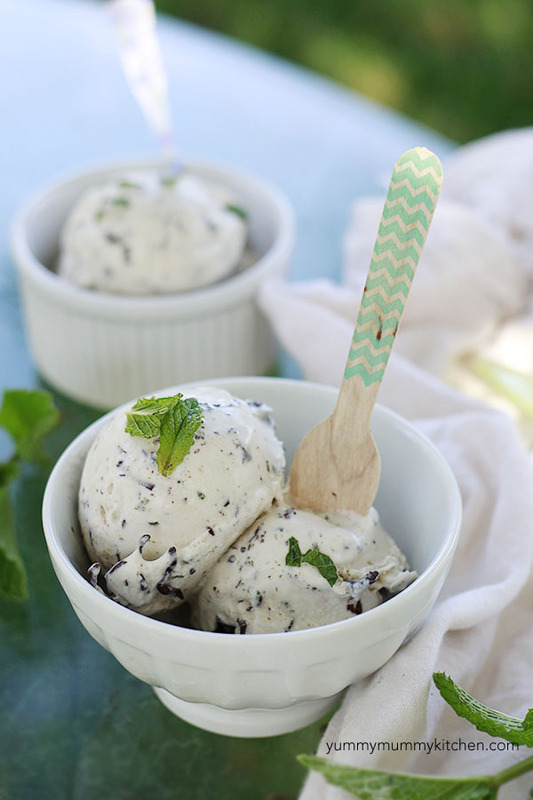 An easy no-cook mint chip ice cream recipe with vegan and low-sugar option. 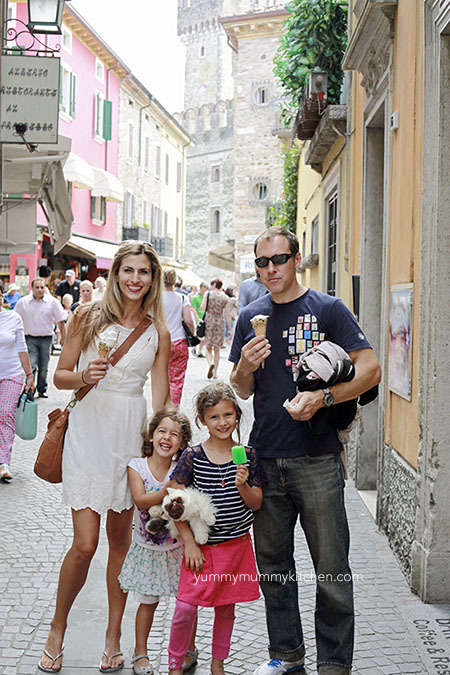 While we were in Italy we ate gelato every single day. I usually avoid sugar, but hey, when in Rome Italy. I learned something… when you exercise and eat well the rest of the time, dessert is okay once in awhile. And you’ve got to live a little on summer vacation. As long as it’s made with real food ingredients. I have to cringe a little when I see packaged “skinny” desserts in the grocery store. You know the ones, they tout 100 Calories per ice cream sandwich! 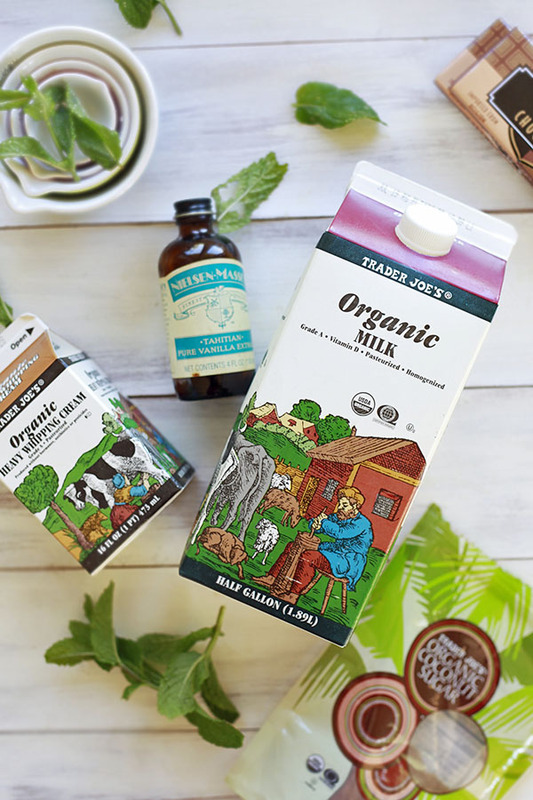 Check out the ingredients… although many are lower calorie, they are often still high in sugar, and made with non-food ingredients like carrageenan, artificial colors, artificial flavors, high fructose corn syrup, palm oil, and other ingredients you’ve never heard of. I’ll take the real, high fat, lower sugar, natural stuff any day. It tastes better and is better for your body. The great thing about making your own desserts is that you can control how much sugar you add. I used coconut sugar here, but often use stevia to sweeten my ice cream. I’m going to recommend granulated sugar in the recipe because the coconut sugar made this ice cream too brown. This is so incredibly simple. Most ice cream recipes call for cooking eggs and then waiting for the mixture to cool. This one requires none of that nonsense – just mix the ingredients up in a blender. I like to make “chocolate chips” with drizzled melted chocolate. This makes the “chips” melt in your mouth instead of a big frozen chunk of chocolate. This is the way Stracciatella gelato is made and I think is so much better. And more beautiful too! Don’t you think? 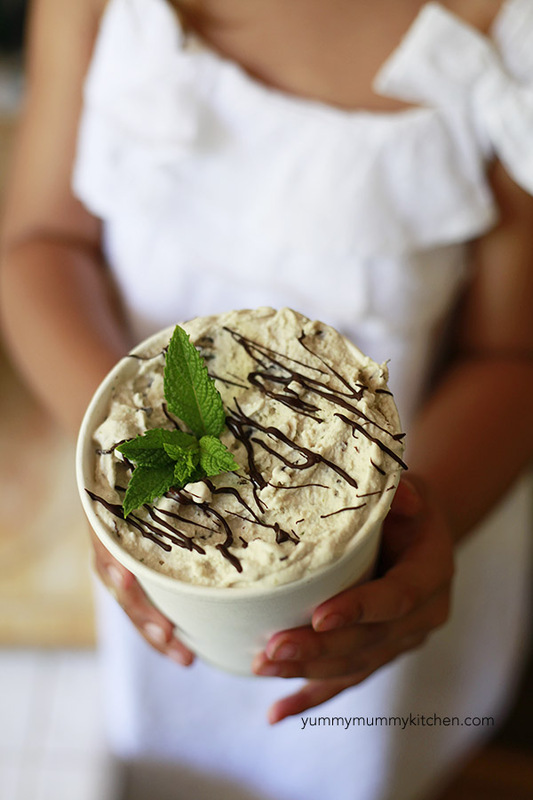 Hooray for simple summer ice cream! P.S. This is where I got my ice cream containers (someone always asks). 1. Melt the chocolate. Roughly chop chocolate if not using chunks. Place in a glass bowl and microwave at 30-second increments, stirring between, until just melted. Set aside to cool slightly. 2. 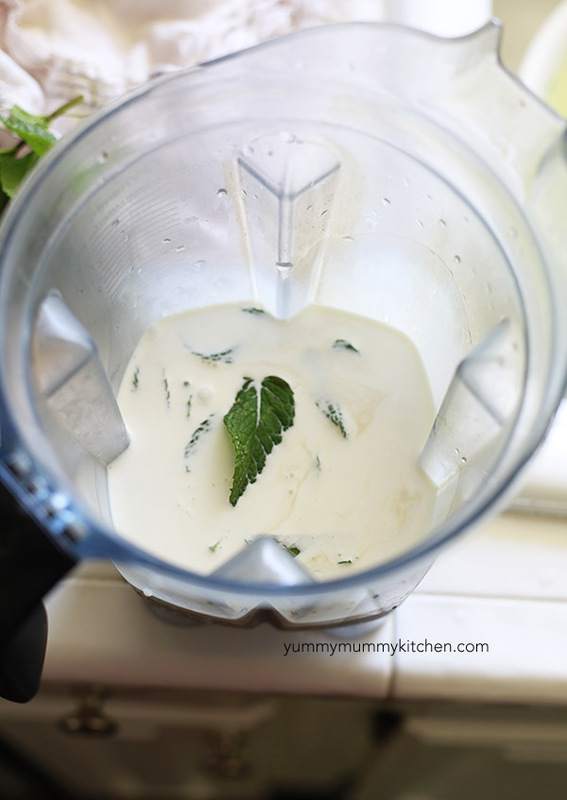 Place cream, milk, sugar, and mint in a blender. 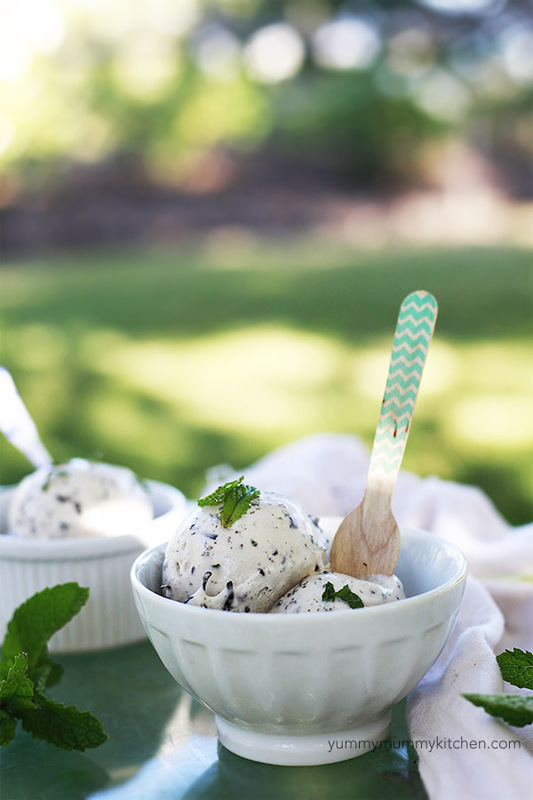 Blend until combined and mint leaves are finely blended. Don’t blend on a high speed or for too long, or you’ll end up with whipped cream. 3. Transfer mixture to an ice cream maker and follow manufacturers instructions to freeze. 4. 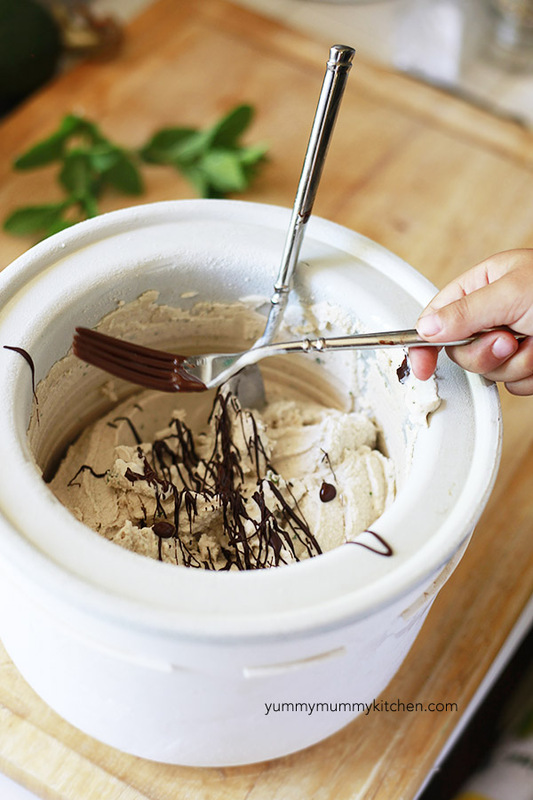 Drizzle chocolate over the ice cream, and stir in. The chocolate should freeze as it hits the ice cream and then break up into little chunks when stirred. Replace dairy with full fat coconut milk. Use vegan chocolate. Be sure your chocolate is gluten free. Enjoy Life is a good gf brand. Replace all or some of the sugar with liquid stevia. Slowly stir in stevia to sweeten to taste.